This is basically a fancy lift system that displays doors opening and closing then warping a player. This system can be copied and paste / used many times, as you will only need to change the "Warp" points in "Lift Up" (lift 1) and "Lift Down" (lift 2). 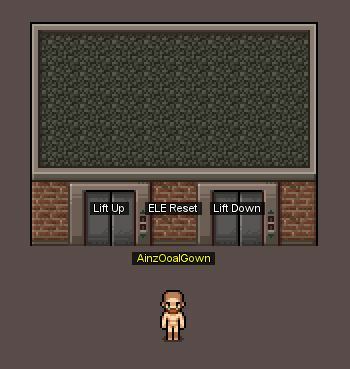 A player can walk up to a lift, press action button press to call the lift. Lift doors will then open allowing the player to enter the lift. Lift doors will then close. Player is then warped to another lift located anywhere in your world. Doors to lift open ejecting the player, then closing again. Only one I found so far, when triggered all lifts in game visually change for the Player ONLY. 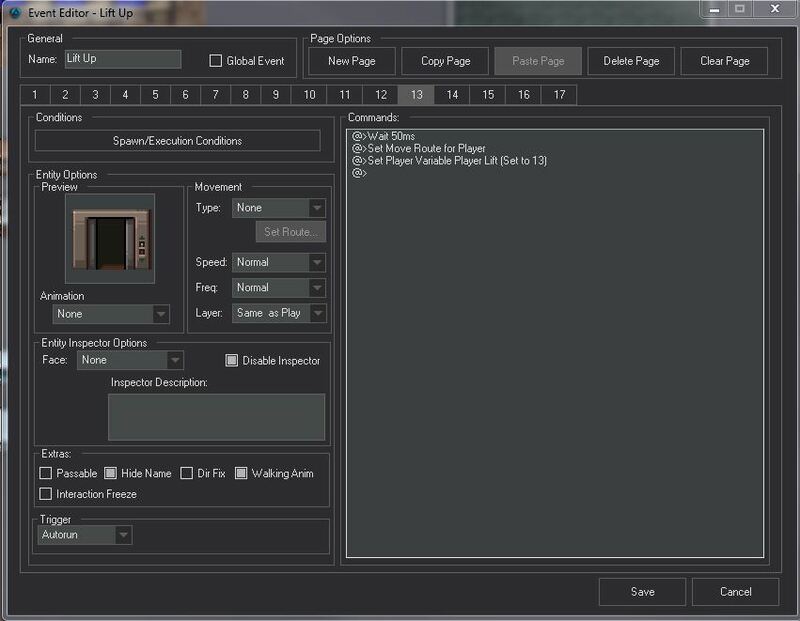 This isn't a big issue, as the player wont see any of the other lifts. 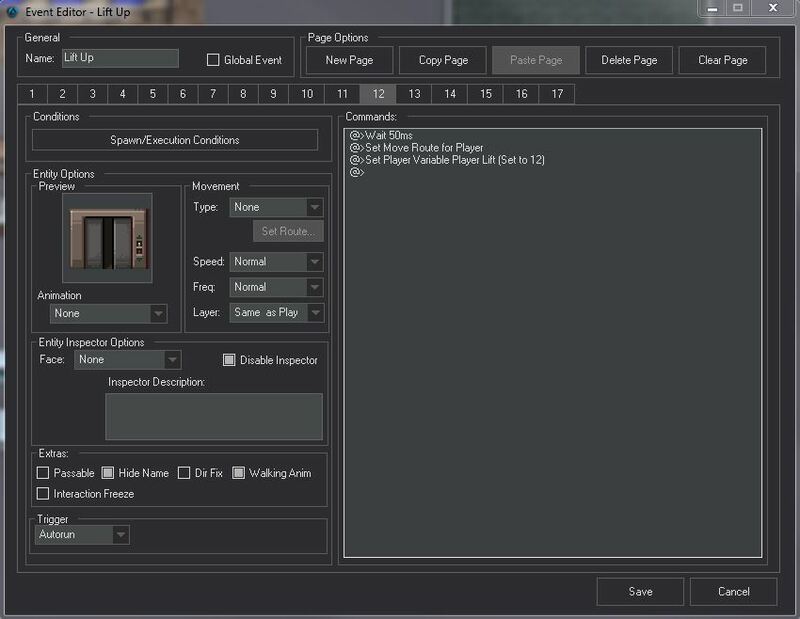 First we need to make a player variable to hold the lift stage process, so create a new player variable and call it "Player Lift". 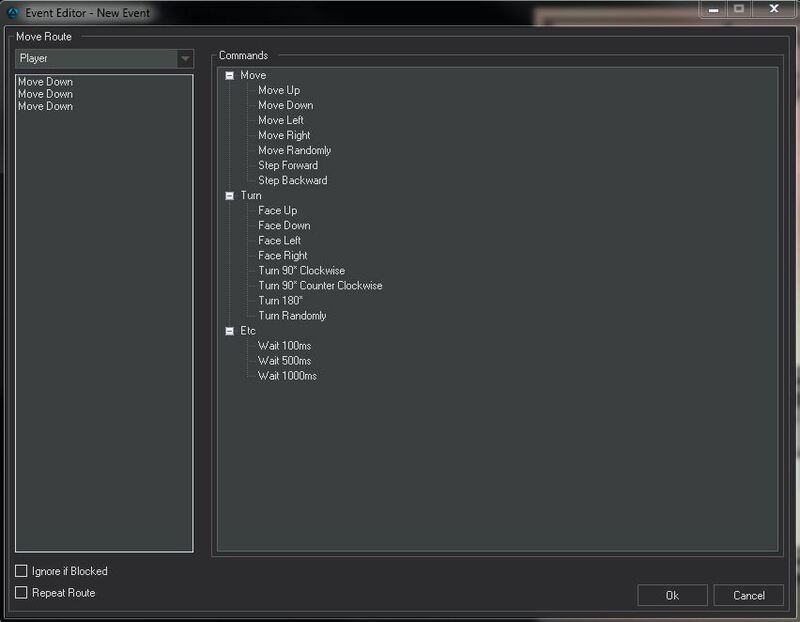 Second we create a Player Lift Switch for a On/Off condition we use later. Now we need a start and finish point for the lift. This can be on the same map or anywhere in your world, as well as this system can be replicated (used) many times. 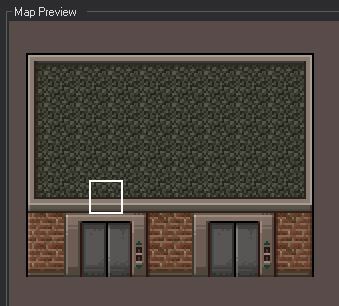 Here I have put the lift right next to each other. But as you can see you need to have it so the doors are closed. 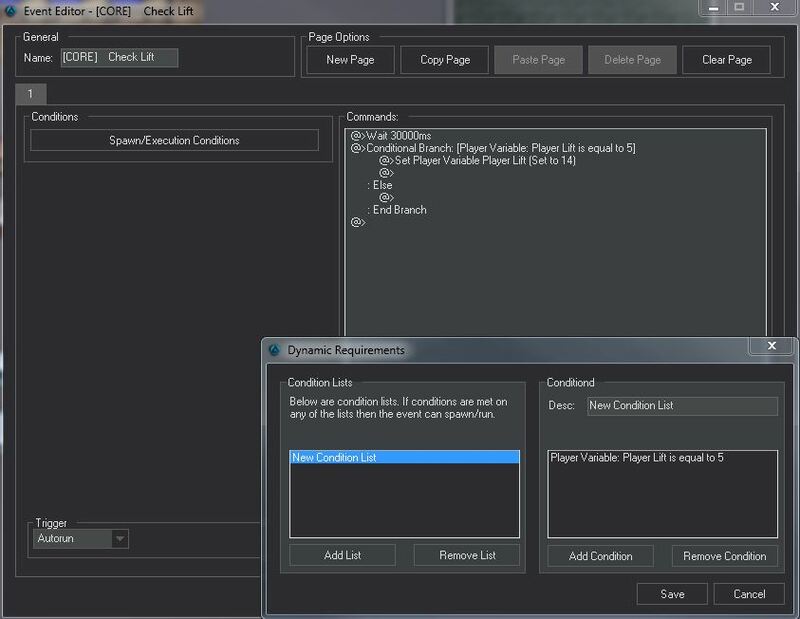 NOTE: “Ele Reset” is not needed, I used it during testing to reset the player lift variable. Next we make a map event. This will be the "Lift Up" event (we will make the second lift later based on the first one). 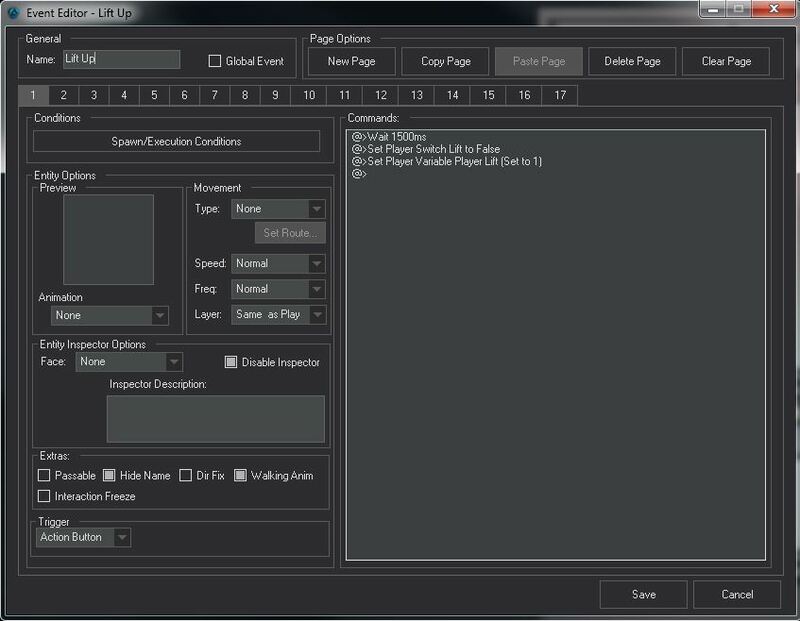 This will be the condition of page 1 and ever page on from this will be "Player Lift is equal to +1". So page 1 "Player Lift" var will be 0, page 2 "Player Lift" will be 1 and so on. 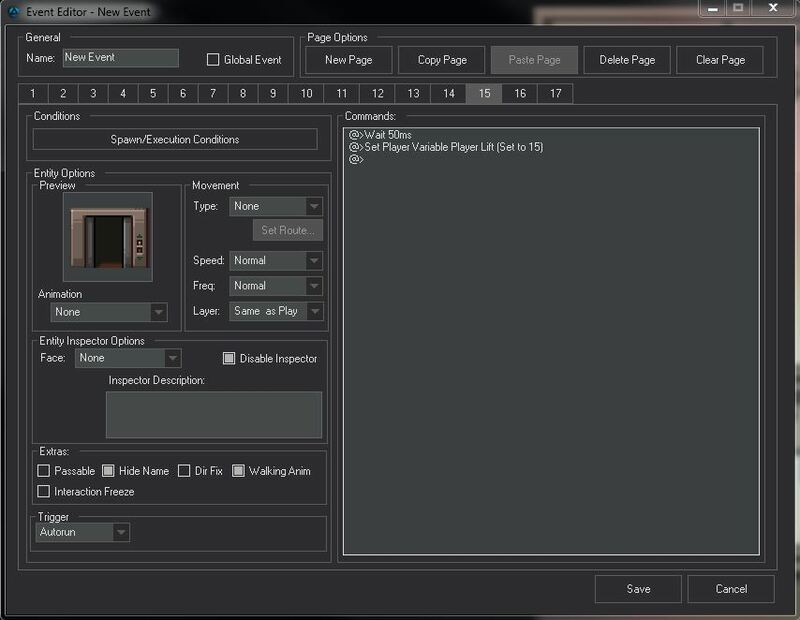 Page 1 "Trigger" will be set as "Action Button", as we want to player to call the lift through an action. Each page has entity preview set to the doors opening. Page 5 is different as now the doors to the lift are fully open. So we want the "Trigger" to be set to "Player Touch" so that when the player steps into the lift the process continues. Page 6 is where the action starts. 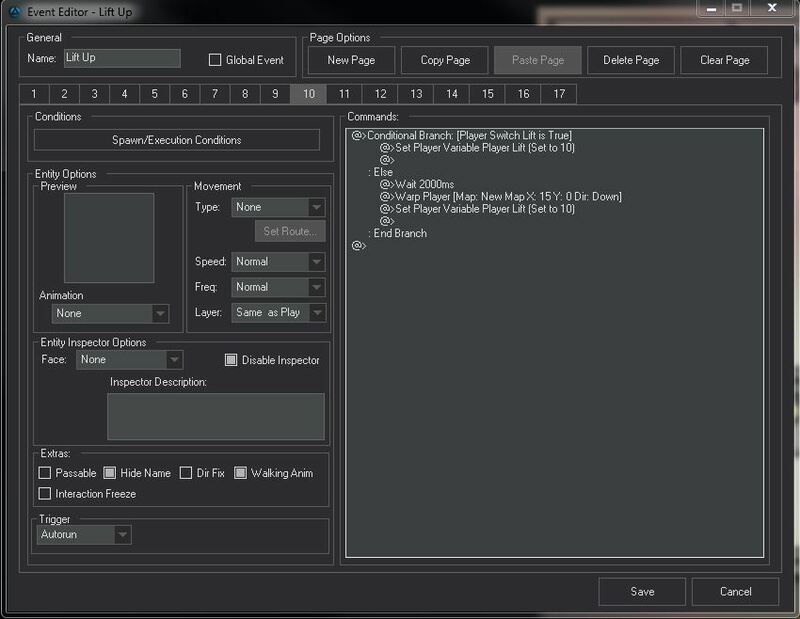 The "Trigger" Process for the page is "Player Touch", so only triggers when a player walks onto the event (enters lift). When this happens the users control of his character is locked out until the lift process finishes. 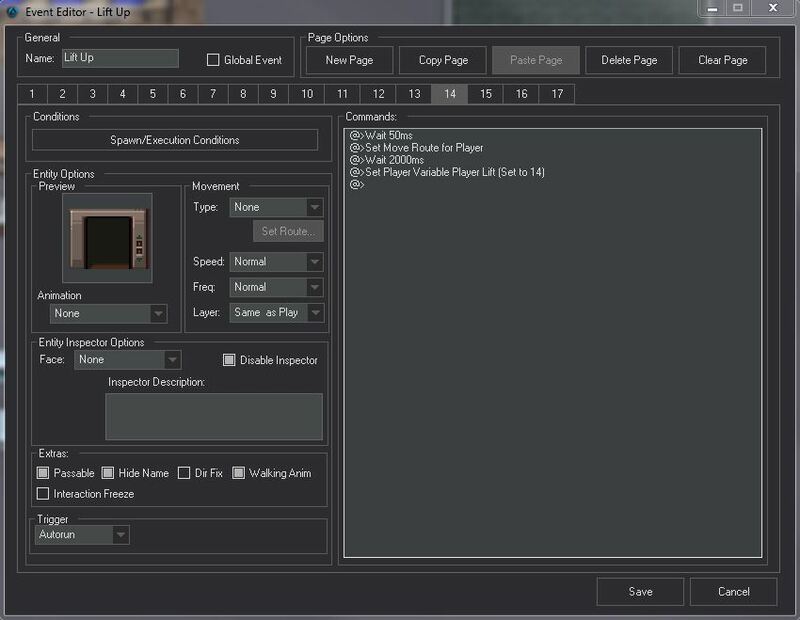 NOTE: This page is "Passable" to allow the player to touch the event and move through it. All previous stages are NOT passable. 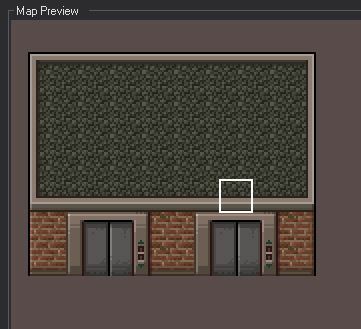 NOTE: We don't set a entity preview, as the map tiles should be the lift doors closed. If you have got this far then I have to tell you we have another 17 pages to go... I joke! Now we have the "Lift Up" or (Lift 1) complete we can use it as a template for "Lift Down" (Lift 2). 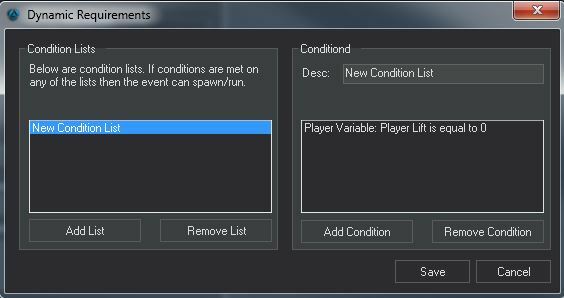 So Save the event the copy and paste the event to the place you want the second end of the lift you want to be! Now you should have a fully working Lift System! You can copy and paste the lift as many times as you want, and you just need to set the "Warp" points! Hoping it will inspire people to use the power of the event system, as can add many features to your game using it! I personally would make the lift more like pokemon where you go to a seperate map and leave the map and arive at your floor destination. 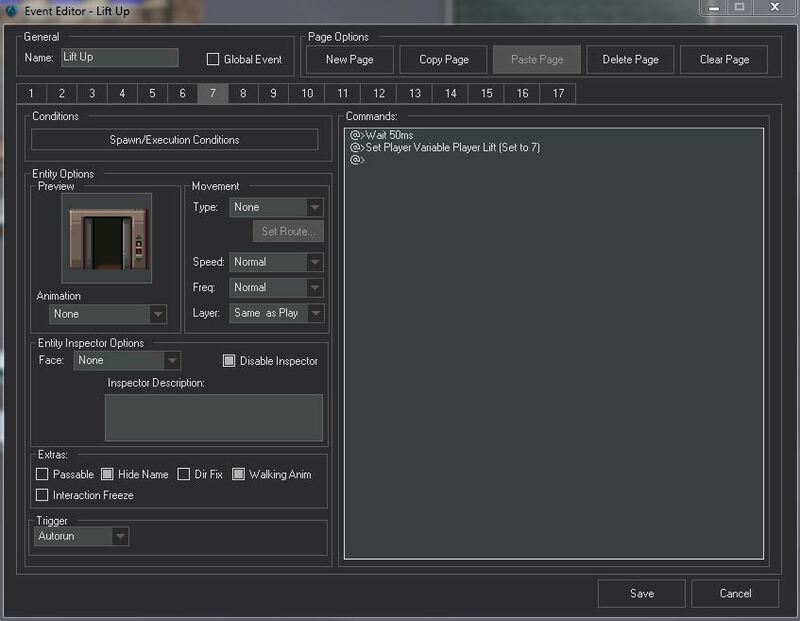 You can even select your floor using a multi select dialogue. Good tutorial and interesting use of the event editor though! Thats a good idea, could be done by adding a option set to pick the floor. 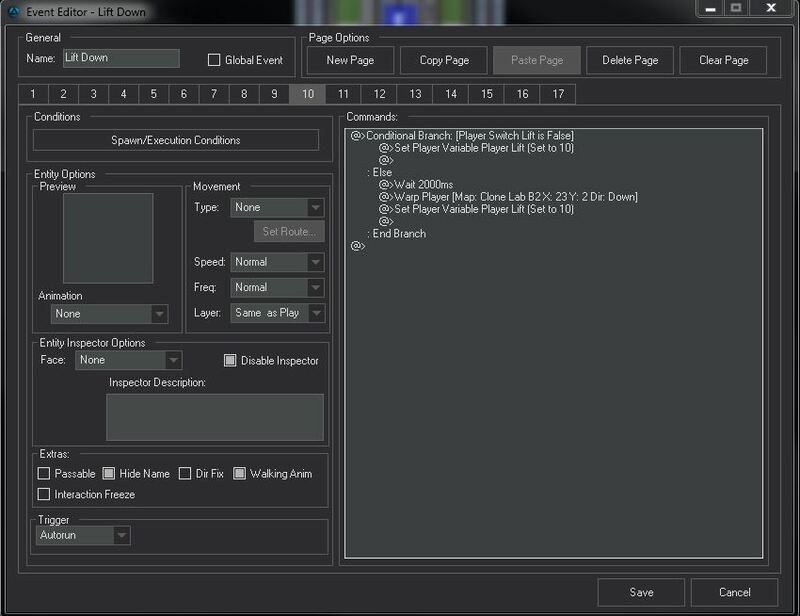 Why I did it based on a variable to set the lift process so it can be be extended. 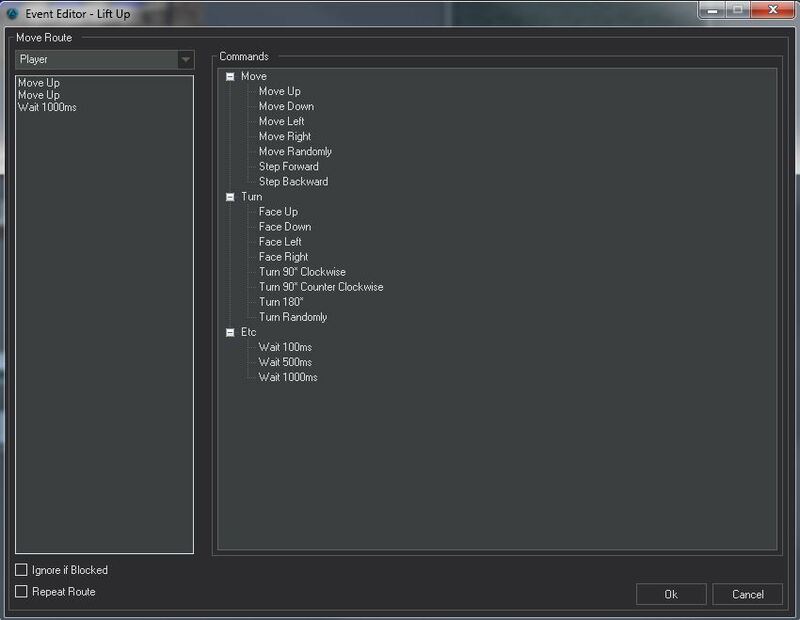 Would also need to change the Player Switch Lift to a variable for the defined floors I think. would this work with the interaction of multple players though trying to use at the same time ? what about the animation cycles ? Hmmm not sure, I believe the animation plays for everyone? I will test this and advise. Actually now that I think it will work(visually) for just the individual for animations and whole process, as it is using a "Player" variable and not a "Global". So only the player will see the lift change (doors open/close and such). 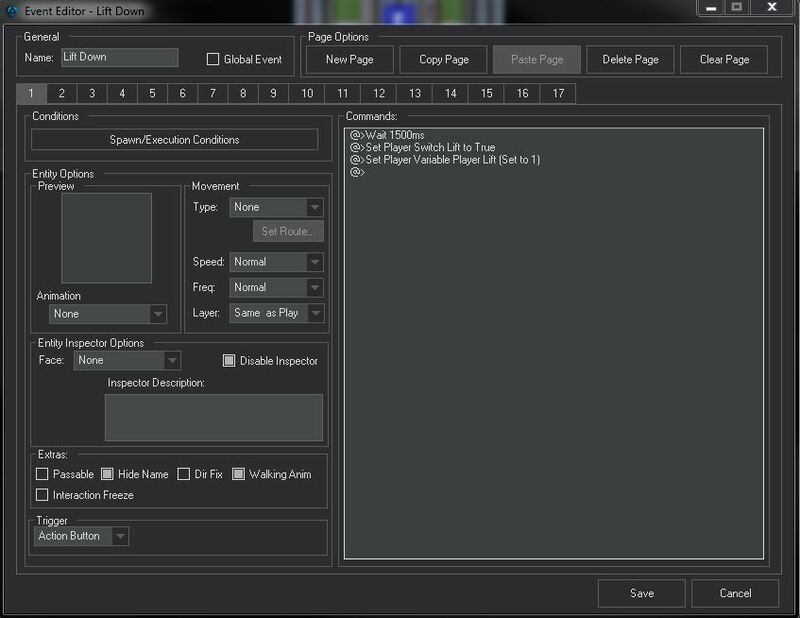 EDIT: Just tested and works so that only the player using lift see changes (doors open/close) this is because its based on a player variable. If you did global then everyone would see change, but then you would have to have a global variable for each lift you make for the stages/process.